Yamaha Motor Launches New LCM-X Linear Conveyor ModuleImproved Space Efficiency, Conveyance Accuracy, and Acceleration/Deceleration Performance - News Releases | Yamaha Motor Co., Ltd.
IWATA, October 17, 2016—Yamaha Motor Co., Ltd. (Tokyo: 7272) announced today that it will launch the new LCM-X linear conveyor module from December 1, 2016, which is compatible with the newly-developed "Advanced Robotics Automation Platform" integrated control robot system. The LCM-X boasts space efficiency significantly higher than previous Yamaha Motor models*, and with significantly higher conveyance accuracy and acceleration/deceleration performance, it enables achieving more advanced automation of conveyance than ever before. With its ability to achieve versatile and high value-added transport between processes thanks to its modular structure and linear motor powered, high-speed direct drive, the LCM-X will be the successor to the LCM100. The fact that this model supports the new "Advanced Robotics Automation Platform" integrated control robot system means that a single integrated controller can centrally control every slider movement during transport processes, including circular movements. The LCM-X can also be connected and controlled in sync in every process with one of Yamaha Motor's 2-axis models for more complex movements which are normally only possible with cartesian 3-axis robots. Its all-new structure complete with a newly-developed linear motor, sensor module, and built-in motor driver integrated into the body has almost halved both the module height and the pitch between sliders compared to existing models, as well as improving the acceleration/deceleration speed and repeatability. Additionally, the motors are the ones with absolute encoders, making origin return operation unnecessary. User-friendliness has also been enhanced by slider ID recognition throughout the entire operational area; a top-side full cover to protect the guide rails, motor, and sensor from falling objects; a connection unit that achieves one-touch physical positioning and electrical connection of each module, etc. Photograph shows two 500mm modules joined together. As monozukuri sites are increasingly manufacturing diverse products in varied amounts due to shorter product life cycles, higher efficiency is also demanded of transport processes. 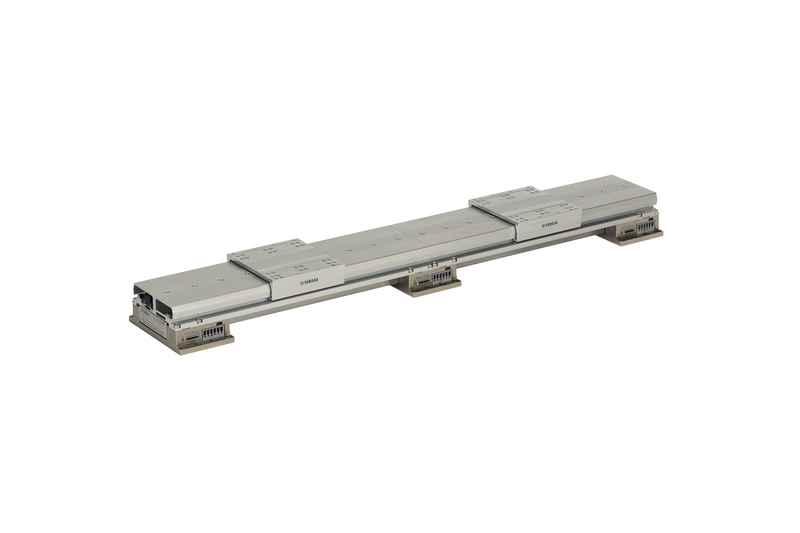 Against this background, we began the development, before its launch in 2013, of the LCM100 linear conveyor module, which achieves more flexible transport, greater advancement, and higher efficiency than conventional belt conveyors or roller conveyors. In response to requests for a model that achieves even shorter transport time and a smaller footprint, we then developed the LCM-X, which achieves narrower-pitched, more precise and flexible transport between processes. From industrial robots to controllers, Yamaha Motor's lineup of products to powerfully support the automation of production sites is rich in variation. Yamaha Motor builds on these strengths to pursue greater efficiency and quality in increasingly complex, diverse, and high-speed production sites. The fact that this model supports the "Advanced Robotics Automation Platform" means that a single integrated controller can centrally control every slider movement, including circular movements, allowing for a smaller footprint and saving on cabling. Its all-new structure complete with a newly-developed linear motor, sensor module, and built-in motor driver integrated into the body has almost halved both the module height and the pitch between sliders compared to existing models, as well as significantly improving the acceleration/deceleration speed and stoppage accuracy. The newly-developed high-precision full-range absolute sensor eliminates the need for origin return, allowing the user to carry out start, stop, and return operation with ease. The ID of each slider can also be detected at any position during transport processes. The top side features a cover to protect the guide rails, motor, and sensor to prevent potential falling objects during any operation processes from causing malfunction. Additionally, the connection unit enables physical positioning and electrical connection of each module in one-touch operation, achieving simplified installation including the joining of multiple modules.